"Hello, where are you? ", — rasped out the interrogative voice of my friend, — "Listen, do me a favor, will you? 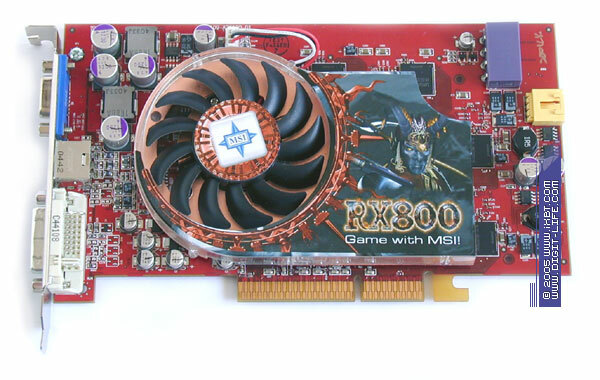 ", — continued he ingratiatingly, — "I want to replace the cooling device on my Radeon X800, the stock cooler is too weak and noisy. I'd like something more reliable. Can you spare a couple of minutes? I need good advice on a worthy device." "Are you a clairvoyant?" — responded I jokingly, — "I've just written a review of decent coolers for video cards, the choice is rather wide. So, come to my place in the evening to discuss it!" It's quite a commonplace worldly situation… Certainly not because my apartment always swarms with guests — frankly speaking it happens rather seldom (though I would be too eager if I had more spare time). This situation is commonplace because almost all users are not satisfied with the stock cooling systems, the present video cards are equipped with, especially high-end products. The main blame for this nasty state of affairs lies on manufacturers, market leaders, who have to save every penny under oppressing competition. They are forced to follow the principle "if it as much as stirs, it's OK! ", and the major percentage of the production cost reduction falls to cooling systems. 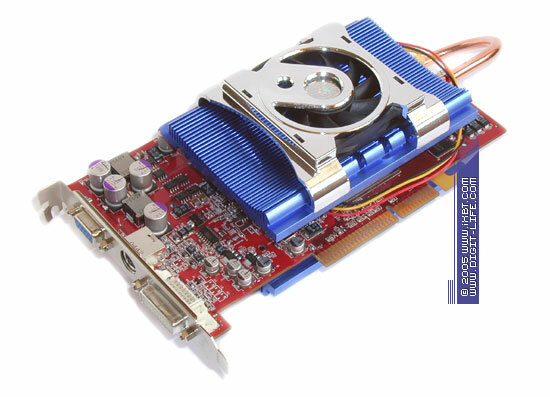 There are exceptions of course - video cards, equipped with advanced coolers or even water coolers. But these exceptions prove the rule. The price difference between a modification of a top video card with a super cooler and that with a regular solution covers the cost of at least two or three decent coolers. Thus, customers find themselves on the horns of a dilemma — either to accept the reality commanded by vendors of graphics solutions (in other words, to buy what is available) or to seek safety in the camp of "black sheep" — manufacturers of advanced cooling systems. 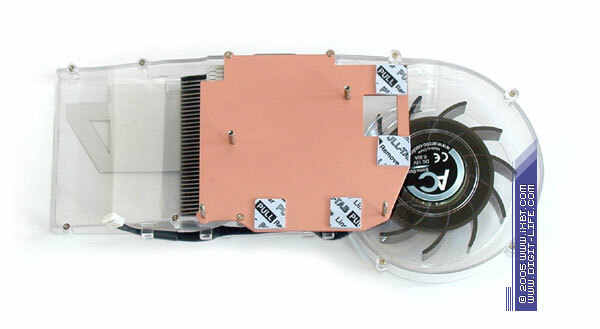 Fortunately, the latter do not balk the needs of computer geeks — they offer an interesting though limited range of alternative cooling solutions for video cards. So, today we are going to have a short excursion into those solutions and we shall submit six most interesting models to your judgement — a single model from each of the following manufacturers - Arctic Cooling, Cooler Master and GlacialTech, as well as three models from Zalman. We shall inspect their functionality and technical properties in tandem with ATI Radeon X800XT Platinum Edition from MSI (RX800XT Platinum-VTD256). Let's get down to it! 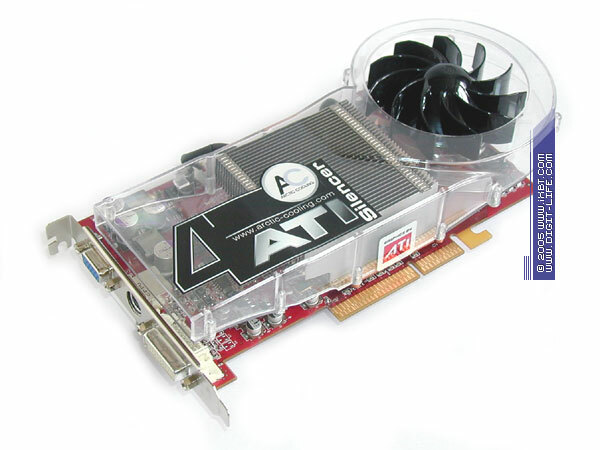 The first cooler in our today's agenda is the stock cooler by the ATI's reference design adapted to video cards based on VPU Radeon X800. 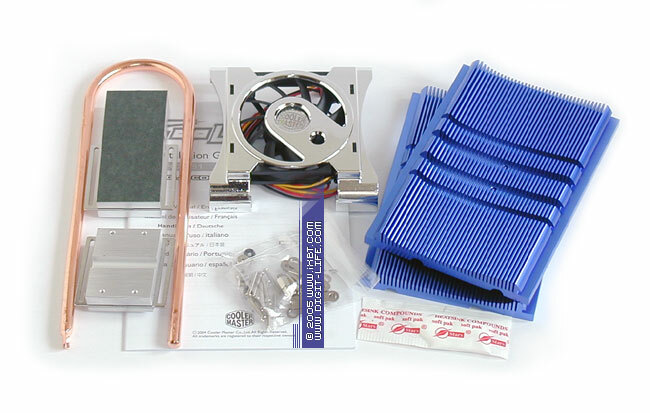 Though this cooler has some noble traits (it features a copper folded-fin construction — accordion folded finning soldered to the 1mm thick heatsink plate), it offers nothing special in technical terms. The total heat exchange area is just about 200 cm2, which is clearly not enough to provide necessary cooling efficiency. 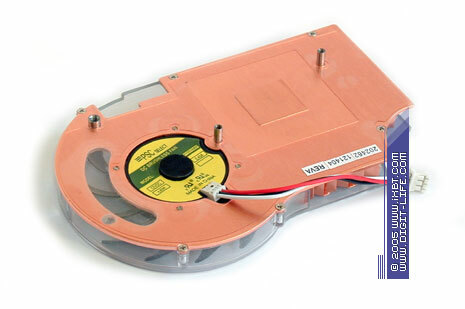 The purely axial configuration of impellers (70x70x10mm) also lets the device down, it actually cannot act as a centrifugal fan and is not optimal at blowing through the heatsink. The stock cooler demonstrates quite mediocre results in our tests — at minimum rpm (2000rpm) it constantly exceeds the maximum limit of 85°C (i.e. this mode is not virtually supported — the temperature control system of a video card has to increase the rotational speed from time to time to cool the chip down), at maximum speed it generates an extremely high noise level that spoils the effect of good thermal efficiency. The video memory is not in very good conditions either, demonstrating noticeable heating even when the cooler operates "at full swing". As a result, it does the job only satisfactory. Probably even less than satisfactory. 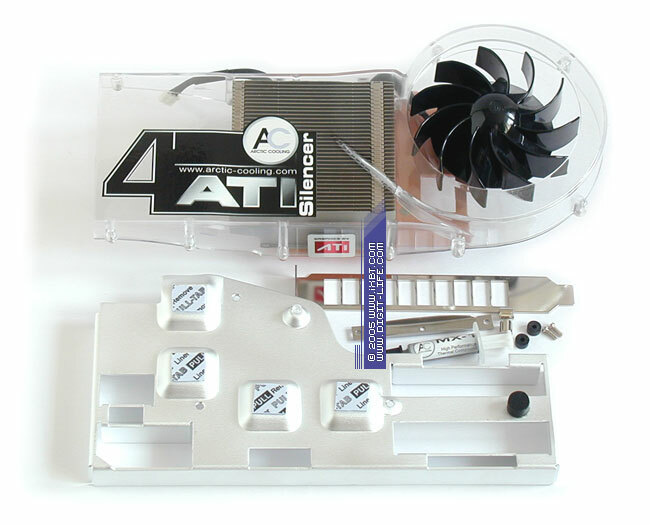 And now let's proceed to the cooler from Arctic Cooling (by the way, this company is well known among computer geeks) — video cooler ATI Silencer 4. Silencer 4 is notable not only by an impressive exterior of a superman (the dimensions alone count for a lot — 220x98x33mm! ), but by a decent technical stuffing as well. The key feature of the cooler is a strong-knit heatsink, a combination of a copper 2mm plate and aluminium finning implemented by the bonded-fin technology (a fin is 0.3mm thick) with the total heat exchange area of about 1300 cm2. The finning is soldered to the base to ensure minimum contact thermal resistance. Another feature — the heatsink base extends to the front memory chips (the thermal contact is provided by heat-conducting elastomer spacers). And though this method for combined cooling of VPU and memory is rather questionable (the heatsink absorbs additional thermal load — the memory and the video chip heat each other), it is actually rather helpful. 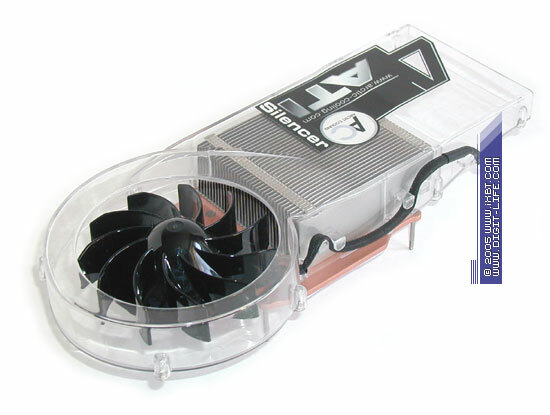 Silencer 4 features an excellent ventilation system — the heatsink and the centrifugal 70x70x20mm fan are packaged into a single airduct to provide coordinated and efficient operation (the cooler construction provides well formed air flow of high static pressure and thus the optimized blow through the inter-fin heatsink channels). 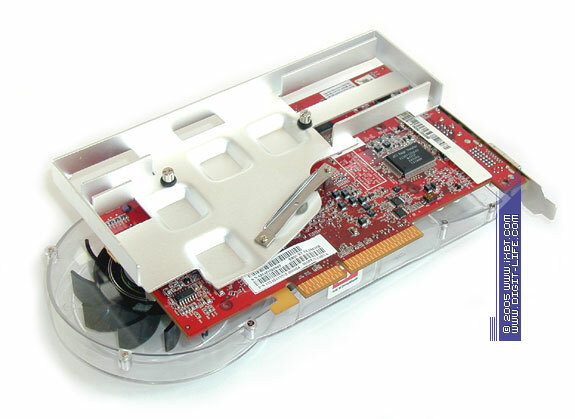 The back side of the video card is not ignored either — Silencer 4 comes shipped with an additional aluminium frame that acts like a heatsink for the memory chips on the back side. The bundle also includes thermal paste, a retention bracket (we cannot do without it! ), and a rear panel bracket. Well, in practice Silencer 4 does not miss a chance to use its advanced technical stuffing — the cooler manages to demonstrate quite a good balance of thermal efficiency and noise characteristics: Silencer 4 is almost on a par with the currently leading Zalman VF700-Cu in temperature coefficients. What concerns the efficiency/noise ratio, it's second only to GlacialTech NorthPole 1000. 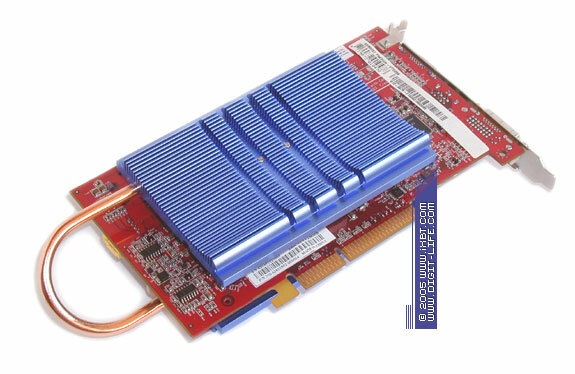 This cooler copes well with ensuring acceptable thermal conditions for video memory (however, its results cannot be called outstanding — as we have already mentioned, combined VPU and memory cooling has both pros and cons). And one more positive point — Silencer 4 is convenient and simple to install (an advanced user will install it for 2-3 minutes, not longer). The next cooler in the list is CoolViva from Cooler Master, an old stager on the cooling systems market. 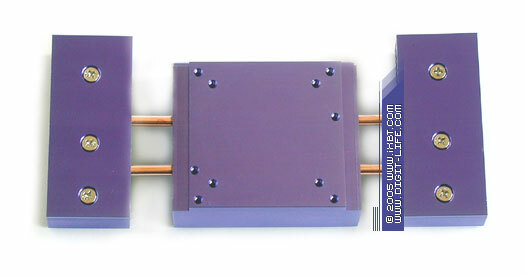 CoolViva is based on the classical "sandwich-system" scheme with heat pipes, it incorporates two aluminium 120x83x12mm heatsinks — the front and the back ones, two aluminium heat exchange units (one of them serves as a heatsink on a VPU, the other acts as a heat exchange that provides advanced thermal contact between the heat pipe and the back heatsink), a retention bracket with a 60x60x10mm fan, the retention mechanism, and a U-shaped heat pipe (6mm in diameter). CoolViva construction is very interesting and technically advanced, but unfortunately it is not devoid of some drawbacks. The primary scourge of such systems is a labour-intensive installation procedure that requires maximum recollection and accuracy. Suffice it to mention that you will have to tighten 16(!) screws to install CoolViva — it conveys a great deal. We also cannot pass off active manipulations with thermal paste, you'll have to put lots of it on the contacts between heat exchange units with heatsinks and heat pipes. You will also have to thoroughly calibrate dislocations of heat exchange units relative to each other in order to install the heat pipe correctly into heatsink grooves. So the installation procedure will prove anything but boring! And the resulting thermal efficiency of CoolViva will actually depend more on user's accuracy than on its technical properties. Nevertheless, even having been most thoroughly assembled, CoolViva is not capable of advanced thermal efficiency. Though this cooler demonstrates truly low noise operation and significantly outperforms the stock cooling system of the video chip as far as efficiency/noise is concerned, it still cannot offer really attractive functionality. 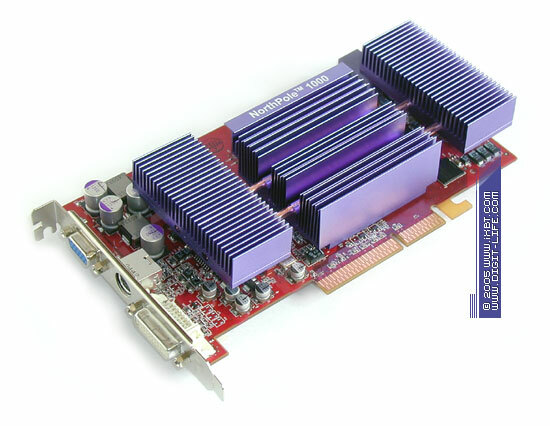 Besides, the video memory of a card operates under bad conditions here — memory chips are blocked by the front and back heatsinks and suffer from heavy heating. So, no matter what you do, you cannot get good thermal efficiency from CoolViva. It's now the turn of NorthPole 1000 from GlacialTech, which has won recognition and respect due to its economical but highly-effective cooling systems. GlacialTech makes its debut with this product in the VPU coolers sector. But what a debut! All brilliant ideas are simple, it's well known. NorthPole 1000 is constructed according to this competent principle to a high degree if not verbatim. Indeed, why complicate things and design intricate configurations, if you can move in a groove?! 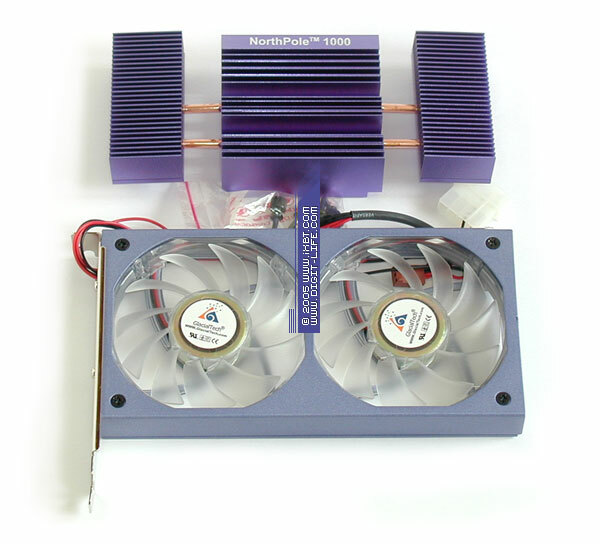 Why not just combine several standard finned heatsinks with a large surface area and connect them with a couple of heat pipes? 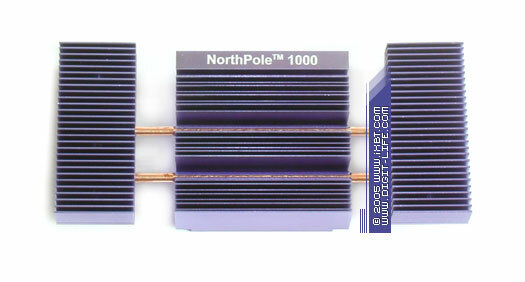 That's what GlacialTech engineers did without further ado — NorthPole 1000 forms a nice combination of three heatsinks, which are mutually complementary. The main unit (68x65x29mm, mounted on the VPU) acts as a primary heatsink for heat pipes, the other two units (30x69x17mm) serve as secondary heatsinks (the ends of heat pipes do condensation) providing minimized thermal resistance of the entire construction. Together with a specialized fan module GT-F1, comprising two slow 80x80x15mm 1000rpm fans, NorthPole 1000 is a well-organized system with good heat exchange potential: the cooler demonstrates high thermal efficiency and offers the best efficiency/noise ratio. 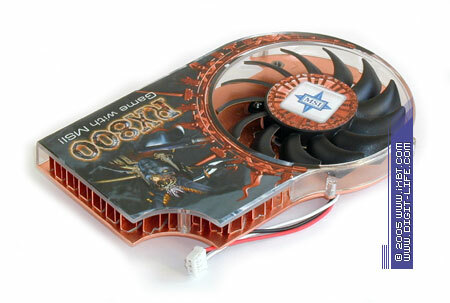 The memory system of a video card is also taken care of — memory chips are not blocked by the heatsinks, they are cooled well by the GT-F1 fan module. What concerns the installation procedure, NorthPole 1000 is beyond competition here: none of its competitors can boast of such a simple and convenient installation process. You just have to fix the heatsink on a card with two screws (it can be done even without a screwdriver), mount the fan module in the nearest slot, and connect a power cable. That's it, the video cooler is ready for action! Piece of cake. It can be said in all respects — purely technical as well as usability. Crack on, boys!